UNITED NATIONS (AP) — President Donald Trump on Wednesday defended his work to settle a nuclear deal with North Korean leader Kim Jong Un, saying he has given up nothing but his time during a June summit yet stands on the cusp of denuclearizing the North. In a wide-ranging news conference on the sidelines of the U.N. General Assembly, Trump told reporters that despite tough U.S. sanctions against the North staying in place, he believes that Kim wants to get a deal done because of their close ties. He wouldn’t put a timeframe, however, on when the two leaders might settle the standoff. “We’re not playing the time game,” he said. It has lasted for decades, flummoxed a long line of U.S. and South Korean presidents and had many fearing war last year during a series of increasingly powerful North Korean weapons tests that experts believe put the country close to a long-time goal of viably targeting any spot on the U.S. mainland. Trump and his top diplomat, Mike Pompeo, are trying to get past the deadlock that has followed the Singapore summit. Pompeo is planning to visit Pyongyang next month to prepare for a second Kim-Trump summit. Japanese Prime Minister Shinzo Abe Wednesday also said separately that he wants to meet with Kim though no details had been decided on yet. Trump’s optimistic comments come amid widespread skepticism that Kim will actually relinquish an arsenal that Pyongyang likely sees as the only way to guarantee the Kim dynasty’s continued authoritarian rule. Although Trump maintained that he’d given up nothing in his dealings with Kim, he has faced criticism for his decision during the Singapore summit to scrap annual U.S. military drills with ally South Korea. Critics called it a concession for the North, which has long railed against the drills as invasion preparation and proof of U.S. hostility. Trump said Wednesday that he’d long wanted to stop the drills, which had always been portrayed by the allies as defensive in nature, because of their high cost and said he could restart them if needed. “For the taxpayer, we’re saving a fortune,” Trump said. Trump also made the stunning claim that former President Barack Obama told Trump that Obama was “very close” to going to war with the North. The State Department said Pompeo was invited by Kim to Pyongyang, the North’s capital, “to make further progress on the implementation” of agreements made during the Singapore summit and to set up another leaders’ meeting. Pompeo met earlier Wednesday with North Korean Foreign Minister Ri Yong Ho at the U.N. General Assembly meeting in New York. Pompeo said on Twitter that his meeting with Ri was “very positive.” There were no details immediately available about what the diplomats discussed. “Much work remains, but we will continue to move forward,” Pompeo said. 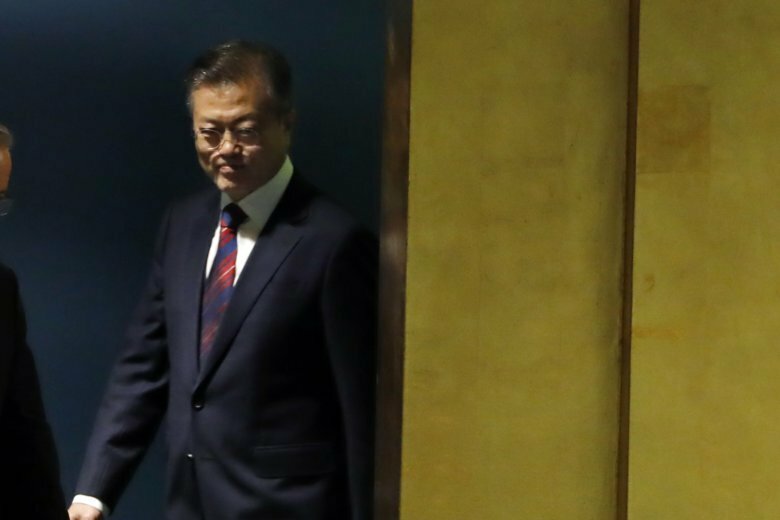 Also at the U.N. session, South Korean President Moon Jae-in said high-level diplomacy has “removed the shadow of war” that hung over the Korean Peninsula last year as Kim and Trump threatened each other with destruction during the run of North Korean weapons tests. Moon met with Kim in Pyongyang last week and has been the leading force behind the summitry. He and others hope another Trump-Kim summit will lead to disarmament progress. Diplomacy has stalled following Kim’s vague promise at the Singapore summit to work toward “complete denuclearization” of the Korean Peninsula in exchange for U.S. security guarantees. At the heart of the impasse: a North Korean demand for a declaration to formally end the Korean War before it takes any major disarmament steps. That war ended in 1953 with a ceasefire, not a peace treaty. Washington wants the North to first provide a list of the contents of its nuclear arsenal before agreeing to that war declaration, which could remove a big piece of diplomatic leverage over the North. Also Wednesday, Russian Foreign Minister Sergey Lavrov warned that dismantling an Iran nuclear accord would threaten global efforts to halt North Korea’s nuclear program. Lavrov and others defended the 2015 Iran deal at a U.N. Security Council meeting chaired by Trump about non-proliferation. Trump pulled the U.S. out of the accord, arguing it wasn’t tough enough on Iran, and is threatening new sanctions. Lavrov said dismantling the accord would “be counterproductive for the efforts under way now to denuclearize the Korean Peninsula. Follow Foster Klug on Twitter at @APKlug. AP writer Angela Charlton contributed to this report.